This combination of Laura Mercier, Eve Lom, Clarins, Benefit and No7 has transformed my skin over the past few months. Basically after I came back from North America my skin went rapidly downhill and I had dryness, dullness and spots. 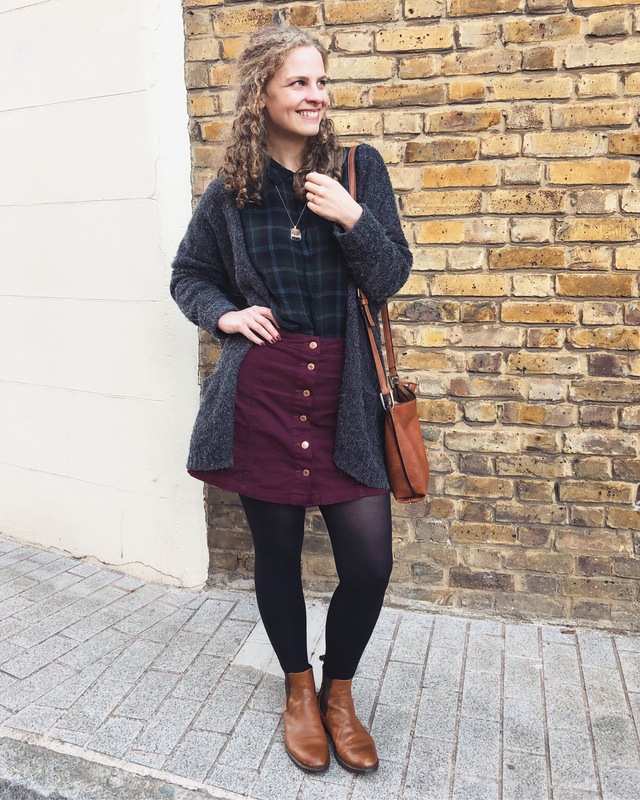 I had to change my routine completely, and I want to share all the things I’ve found, because they are uh-mazing. Fair warning before we begin: Recently I’ve been on a what can only be described as an Eve Lom binge. Prepare your blog-reading eyes because this is just the first instalment. May as well start at the beginning of my routine. Also, sorry, these photos are not as good as I was hoping, I didn’t realise until I started writing but now I want to share, DAMMIT! I don’t have time to wait until I’m home during daylight hours again! Ok anyway. To be honest, I chose Laura Mercier’s Oil Free Primer because I was idly walking around Brighton with my boyfriend, went into a shop, someone I used to work with was there, and she recommended it. But I’m really grateful she did. My foundation lasts longer, comes off easier, and looks WAY better. This stuff, if you have oily or combination skin, is perfect. It feels silky when it goes on, and there’s no colour to it, or GLITTER. I can’t stand glittery primer (it’s not ‘shimmer’ either, don’t start that now). Get it for £29 – it lasts for quite a while too! This is such a bad picture. Urgh, just click the link and save me from myself. Clarins Instant Concealer is pretty good, I’d say it’s the only product in my makeup bag that I don’t love, just tolerate though. It’s £21, and it does last for a long time, but they only do three shades and I happen to be really lucky that one is my skin tone. While the concealer does do the job well, the bottle is horrendous. it holds air inside it because it’s a stiff plastic which doesn’t shrink down when you use the product, which I feel must mean it ruins the concealer after a while, or there are lots of preservatives in it. 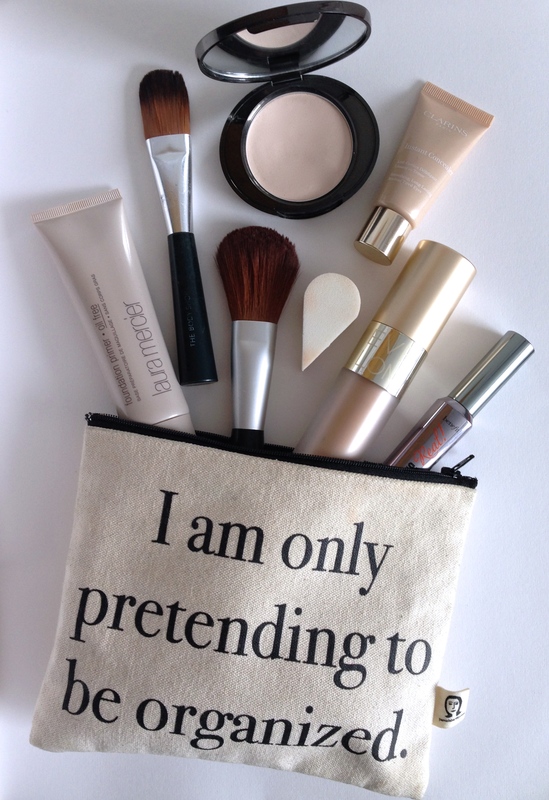 If you have any suggestions for better concealers, PLEASE COMMENT! Help me perfect my makeup bag. I had been using Clarins Everlasting Foundation for a long time, and it stopped feeling good. I got a sample of Eve Lom’s Radiance Lift Foundation and adored it, but I was concerned by the way it seemed to streak a bit when I applied it with a brush. This was why I was kind of absent mindedly browsing for a primer, and by using a makeup sponge to blot over it after I put it on, I have pretty much the smoothest face of my life (well, maybe since puberty hit). Yet another terrible photo. 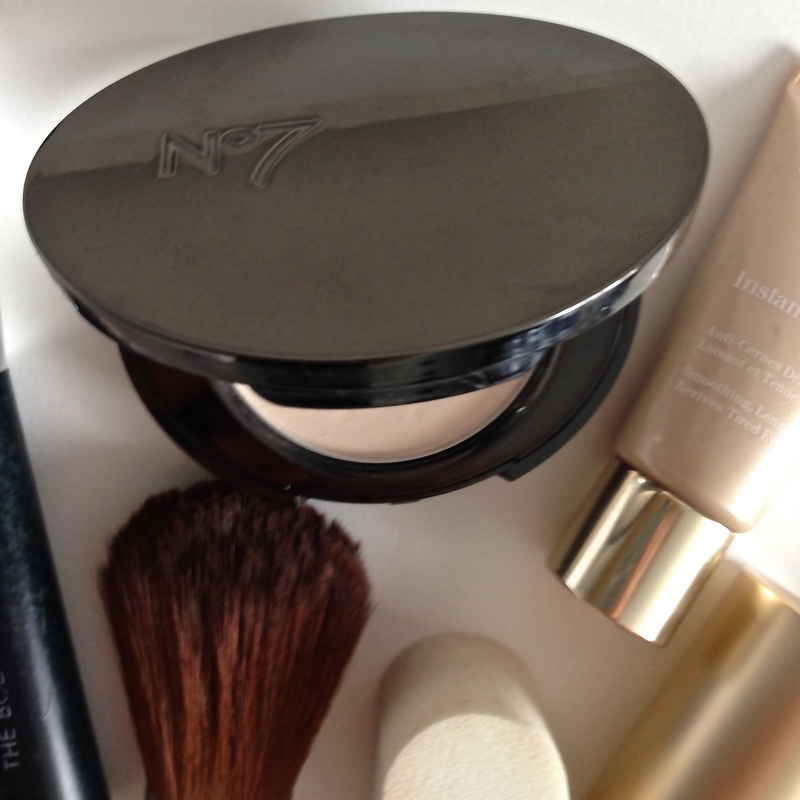 This is No7’s trusty Perfect Light Pressed Powder. You really can’t argue with a product like this, it absorbs oil and keeps my super greasy lids perfectly matte all day. I used to apply it all over when my skin was seriously oily, but I don’t need to do that anymore, just my lids. Very simple, very affordable, I highly recommend it as a powder for someone who doesn’t need to use powder very much. Plus it’s only £11.50! Lastly, here are my applicators. I’ve had this brush, and the one below, for about seven years. They’re from The Body Shop, and wow were they worth the investment. I buy cheap eyeliner brushes which I have to replace every few months, but these two have lasted so well…actually…WHY do I still buy cheap eyeliner brushes? Maybe it’s time for another minor investment. This is my foundation brush, it’s really soft, and spreads foundation perfectly. 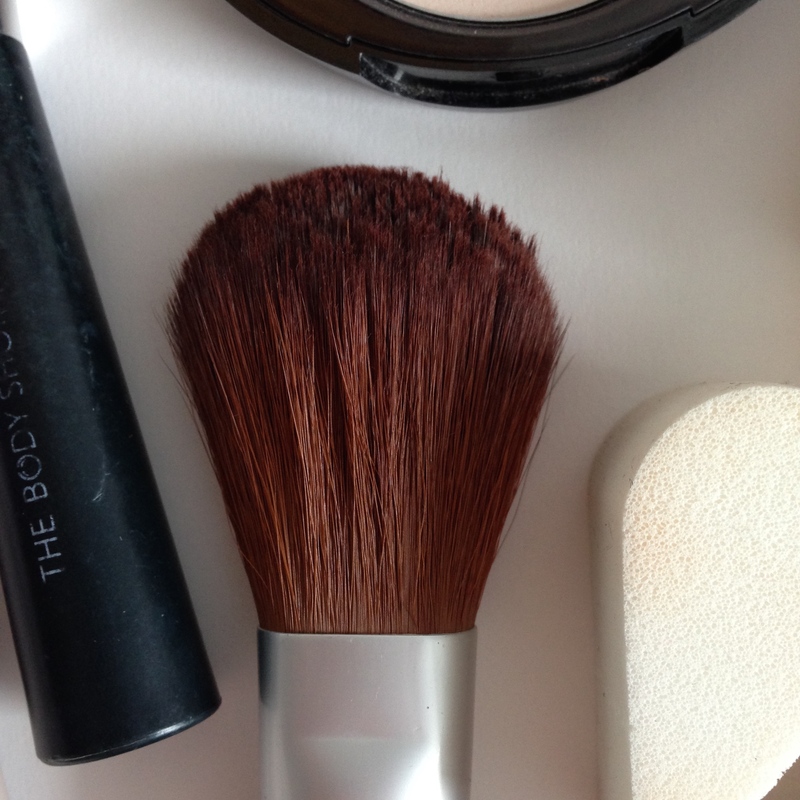 And this is a powder brush, which is what I use to apply powder to my eyelids. I wash these every few months in gentle shower gel like Dr Bronner’s or Weleda, and I think that must help them last longer too. They’re just great. Get them here – because mine are so old I don’t actually know exactly which ones they are, but I’m sure the new ones will be just as good! 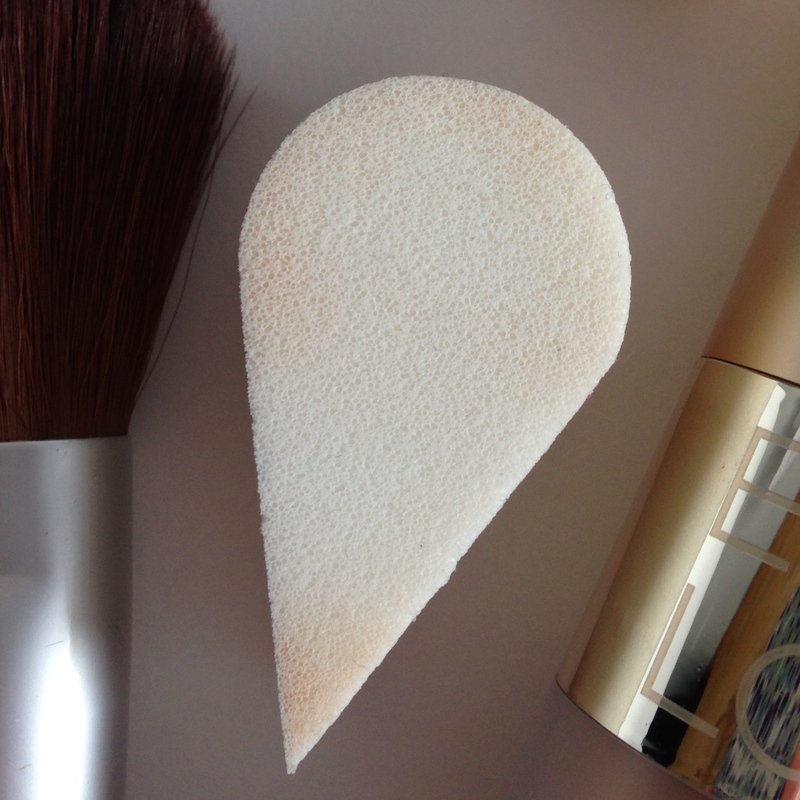 Ending on a slightly boring note…this is what I use to apply concealer and blend my foundation. I use the pointy bit for concealer, and the rounded bit for foundation. This came in a pack of 8 from Superdrug and cost basically nothing, but the great thing about it is that it doesn’t seem to absorb much makeup at all. I washed it for the photo, but very little actually came out! To be honest I bought it because the sponges were arranged in a flower shape…but they do a great job anyway, luckily. This entry was posted in Makeup and tagged Beauty, Makeup. Bookmark the permalink. That makeup back is amazing! !